Tired of the same-old slimy, tasteless lunch meat on your sandwiches? No need to worry, Genji and Whole Foods has you covered. 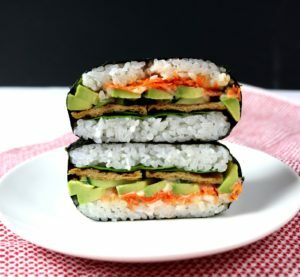 Genji just launched Sushi Sandwiches (Onigirazu) in Whole Foods locations across the country. Jing Chen, one of the Genji’s top-tier chefs, recently won the sushi-chef contest for best new dish with his creation of a sushi sandwich filled with spicy tuna, avocado, and wrapped in a delicate soy crepe. Available in select stores, other options include the Veggie Sushi Sandwich filled with avocado, cucumber, carrots, mixed greens and nori. Craving a little crunch? Try the Shrimp Tempura Sushi Sandwich stuffed with shrimp tempura, crab stick, cucumber, avocado, kinshi tamago, baby spinach, carrots and BBQ sauce. Refresh your palate with our California Sushi Sandwich made with crab stick, avocado, cucumber, red cabbage and lettuce. You’re gonna want to take a picture of these gram-worthy sandwiches before digging in. Get social and share your experience with #Genjisushisandwich. Follow Genji on Twitter (@GenjiSushiBars), Instagram (@genjisushibars), or Facebook (GenjiSushiBars).